Usually, what comes to mind when one thinks of a nurse is a hospital, or dental surgery. Dreary white wash walls, an air of uncertainty, and a musky yet sterilised scent penetrating the walls. How wrong you would be in thinking of this when thinking of Nurse Jamie. Although Nurse Jamie is a qualified nurse, she is also a certified aesthetician with her own beauty range, and spa. Meaning- she is an expert in all things skin. So, you can put your trust in her carefully moisturised hands, relax, lie down, and let her work her magic. With more than twenty years of experience in the business of beauty you can be sure her products are ground breaking and industry leading. Nurse jamie’s products have gained wide recognition in her field. Nurse Jamie’s products are very popular amongst celebrities. The next best thing, since infrared saunas. So if you want to feel like a million dollars without going into a spa, this may be the range you have been searching for. Not only is Nurse Jamie set on technological advancement, via skincare. Jamie is also set on giving back as well, she says that with every purchase Nurse Jamie Cares donates a portion of their proceeds to women’s empowerment, wellness, and outreach programs that are making a difference to women all over the world. It is no wonder that there has always through out the ages been a huge emphasis on skin care. Skin is our largest organ. It is at the root of our health. It protects us from water loss and UV rays. It helps fight off infection, it regulates our temperture, and has many other functions. Therefore, It is worth looking after your skin, as you will wear it for the rest of your life. Nurse Jamie agrees and this explains the depth of research that have gone into creating her products. We have seen a surge in the amount of people becoming more aware of what they put in the stomaches, and what they put on their face in recent years. 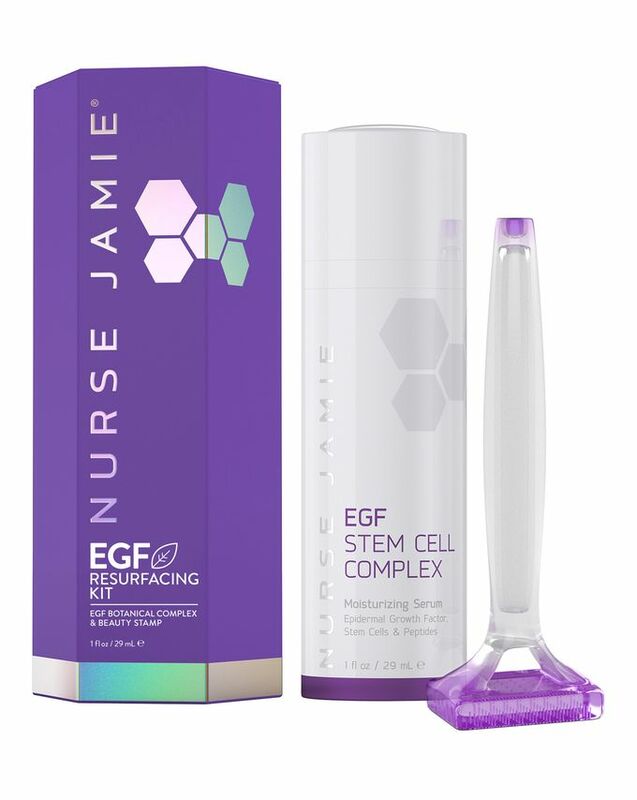 Nurse Jamie’s products are revolutionary as they it work to penetrate below the skin’s surface, at the cellular level in order to produce the greatest change. Here are just a few keys products and tools from the collection. Beauty stamp is a unique micro exfoliation tool that utilises a gentle, ‘press and lift’ action to enhance and promote increased effectiveness of your skincare products. Together with the EGF resurfacing kit they have an overall tightening, smoothing and pore refining effect on the skin. The ultimate soothing cleanser, with calming benefits. Suitable for all skin types, helps to reduce the appearance of redness and calm polysensitve skin. Very effective at gentle cleansing, ideal for those prone to senstive skin, redness or inflammation. Nurse Jamie believes that, “Women are the foundation of this world. We are mothers, sisters, business owners, teachers, nurses and above all nurturers. If we don’t empower each other in good times and bad, who will. I just hope to make a small difference in a woman’s life. That will make a profound difference in mine.” – Nurse Jamie. Core to her business is that she undestands how the every day woman feels. In between raising a family, balancing a job, multi tasking zumba classes with our children school plays. All women are well deserving of a product line that will wash the reminents of this away with the wave of a magic wand. Her skincare is boundary pushing, and dedicated to women’s wellness which unifies and strengthens women across the globe.